Christmas right around the corner and I have been having a hard time figuring out what we were going to do for my youngest. He’s very independent, loves being outside, and enjoys just playing on his own. 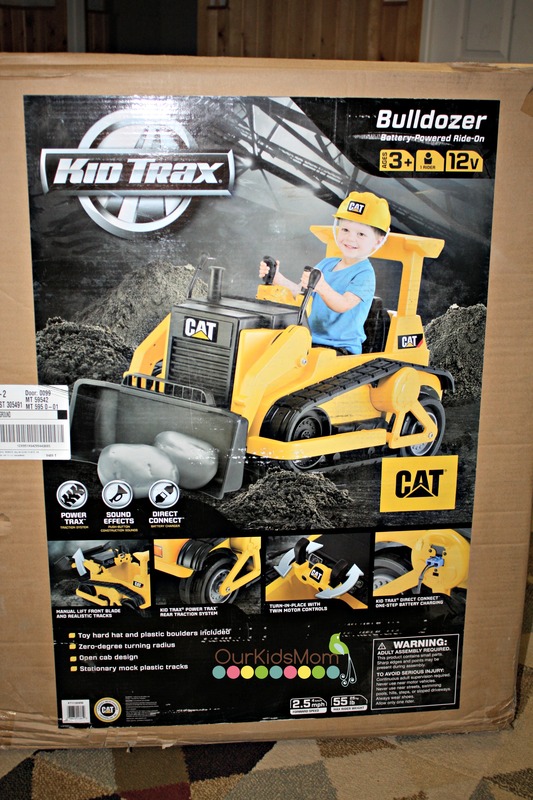 When I was told I was given the chance to review the Kid Trax Bulldozer I knew at first sight that it had Mason’s name written all over it. Taking it out of the box there is a little bit of assembly that needs to be done, but it didn’t take long at all… in fact oldest assembled most of it. 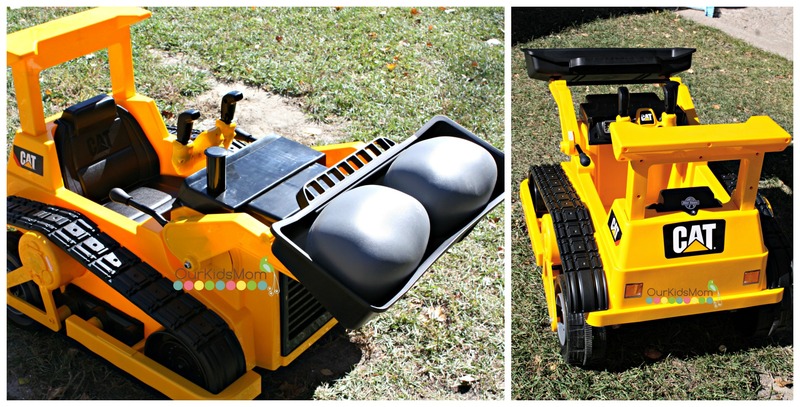 It also comes with two boulders for pushing around and a plastic hard hat. Jumping in Karson had a blast driving it. There is both forward and reverse with a speed of 2.5 mph. In order to move you have to be pressing down on the foot peddle as well as pushing the steering handle forward to move forward or pulling backwards to back up. 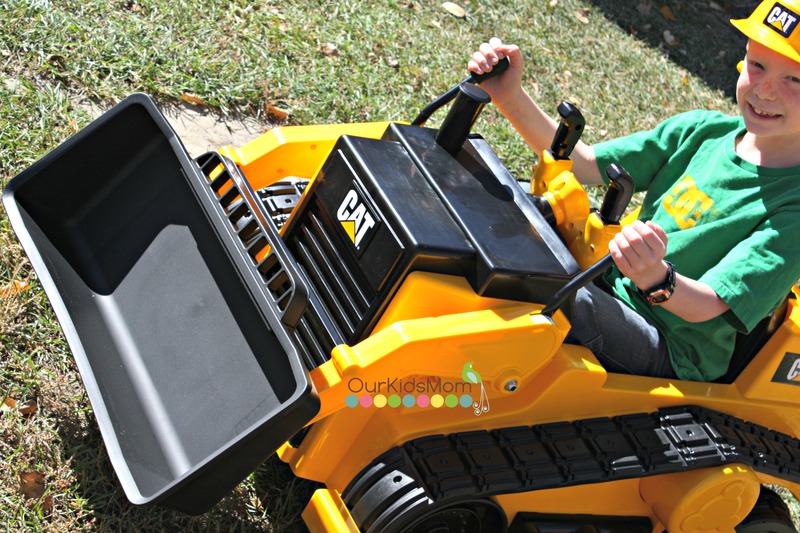 The steering is smooth with a zero turning radius, just like a real bulldozer. The front wheels on are a swivel caster wheel to allow for that zero turning radius. The tires have a rubber traction strip down the center giving optimal traction without slipping. The battery is a 12v battery that needs to be charged on average between 14-18hrs, with a top riding time of 120 minutes. Now the kids do have a hard time waiting that long before they can ride it again, so I try to do it overnight so it’s ready the next day. The charger is a direct connect charging system so there is no having to remove the battery every time it needs to be charged. The front dump bucket is a working bucket, with leavers to lift and lower your bucket. The bucket does not sit flat on the ground so you can not actually scoop things into your bucket, you can just push them around. That being said it is nice in fact that it doesn’t sit on the ground as it would hit any and every bump and get stuck. 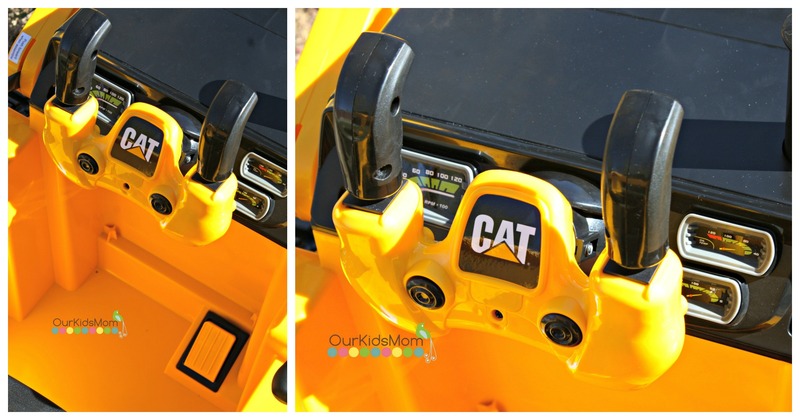 Kid Trax has done an amazing job with recreating this unique Cat® Bulldozer body style to look just like that real thing. With a recommended age of 3+ and a max weight of 55 lbs both young and older kids will be able to enjoy driving a cool machine. Let your child’s imagination soar as they ask to play outside for hours at a time. 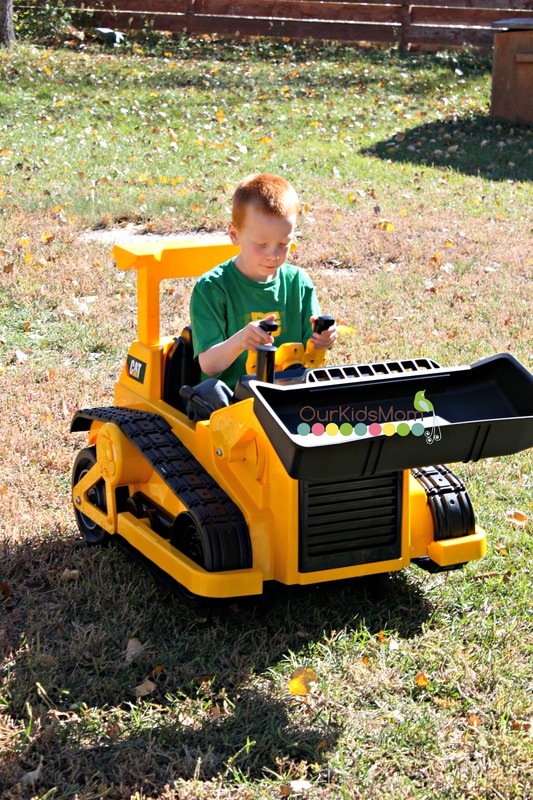 There isn’t going to be anything cooler under the tree this year then then Kid Trax Bulldozer. Head over to www.kidtraxtoys.com and give your kids the coolest gift out there for Christmas this year. 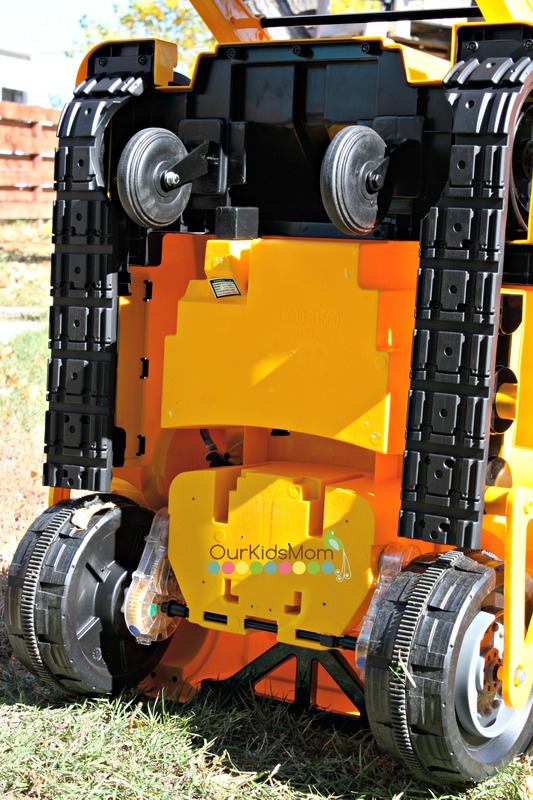 ONE OurKidsMom reader is going to win a Kid Trax Ride On Bulldozer! This giveaway ends at 11:59 PM EST on December 26, 2015. My sons would have so much fun playing with this. Oh my gosh, the VW Beetle Convertible is so cute! My niece would love that one. Your child would be looking like James Bond in that Audi R8 Spyder! I learned it has dual stick steering and zero turning radius. I really like that this bulldozer has a 12V rechargeable battery! Looks like fun to ride! 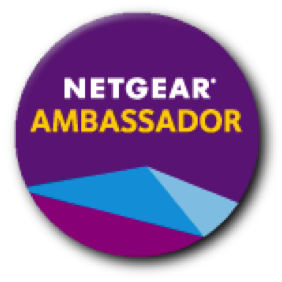 I learned this has a One-Year Limited Warranty | Six-Month Limited Warranty on Battery. This is awesome! I love that it has a 12V Rechargeable Battery. I like the weight limit. I learned that it has Zero Turning Radius and Forward and Reverse speeds of 2.5 mph! So cool! I like the Dodge Charger Police Cruiser!! I learned that the max weight for the bulldozer is 55lbs! I love the black mercedes model as well! It is so cute! That’s the most amazing ride-on toy I’ve ever seen. My son would love that!! I like the direct charging system and it will reverse. Nice for the boys to play on, but I am positive the girls will be on this too. I like that it holds up to 55 lbs. OH GOSH!!! My son would flip over these!! He loves construction vehicles! I love the MINI Cooper….so cute! My boys would so love this!! Also loving the RAM 3500 Dually Longhorn Edition from the website. The entry didn’t close with Instagram name, smilesneeded is instagram. I would love to get the VW BEETLE CONVERTIBLE for my daughter. My kids would LOVE this! Love that it has a Working Dump Bucket! So cute! I like the VW Beetle Convertible. I learned that the max weight is 55 lbs. and has a zero turning radius. Thanks. I really like the KIA SING-A-LONG SOUL CAR too! My little ones would love that as well! This looks like so much fun! Where were these when was a kid. My daughter also loves the VW Beetle Convertible in black with pink seats. My son would also love the Cars Baja Mcqueen Quad. My granddaughter would love the VW Convertible! My son would love the charger police cruiser. I love the Working Dump Bucket! I love that the bulldozer is so realistic! The dump bucket even works. I love the AUDI R8 SPYDER GT, that is awesome! That thing is so cool, where was this when I was a kid? Love that it’s rechargeable. Would love this! I love the RAM 3500 DUALLY LONGHORN EDITION. I wish I could buy my granddaughter the MINI COOPER PACEMAN!!! It is so awesome! Why didn’t they have those when I was little? She would have a blast on this thing! My son would love the bulldozer or the Baja Lightning McQueen Quad! I love that it has a zero turning radius. Most of these riding things turn too wide to be practical and fun. This is so cool! My kiddos would also love the Dodge Charger Police Cruiser. I like that it actually moves around! My son would love to have this….. I love that it has a rechargeable battery! I like that you can go forward and reverse. I like that you can go reverse and forward. They also have an adorable BLACK MERCEDES ML63. I learned that this can hold up weight to 55lbs! &&i love that they can go both forward&&reverse! I learned that it has a ◦Zero Turning Radius. I like that it will hold boys or girls in some cases up to 55 pounds. I also really like the 12volt items, especially the RAM 3500 Dually Longhorn Edition, the truck is awesome. I found they offer a variety of vechiles, including police cruisers & a mini cooper! I saw an ultra cute Disney Fairies Quad that my youngest granddaughter would adore! They have sooo many cute things! Wow, my boys would LOVE this! They would also love the Dodge Charger S.W.A.T edition!! I entered the Minion bluray giveaway. I learned that it goes forward and it goes in reverse at a speed of 2.5 MPH! This is definitely one ride on that my son would flip over! 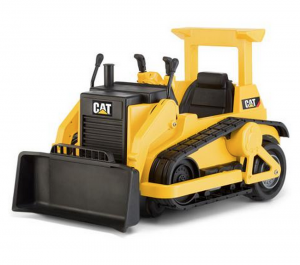 My kids would love the bulldozer and any of their ride ons. I think the Mercedes is pretty cool. WE love the Ram so Id be loving to see the RAM 3500 Dually Longhorn Edition ! Oh my gosh, with the weight limit of this at 55, I have a 4 year old grandson AND two 4 year old grand daughters who would love this and probably work for years! This would be such a wonderful surprise! My grandson is all about construction equipment! I entered Brookside Chocolate wine package giveaway! 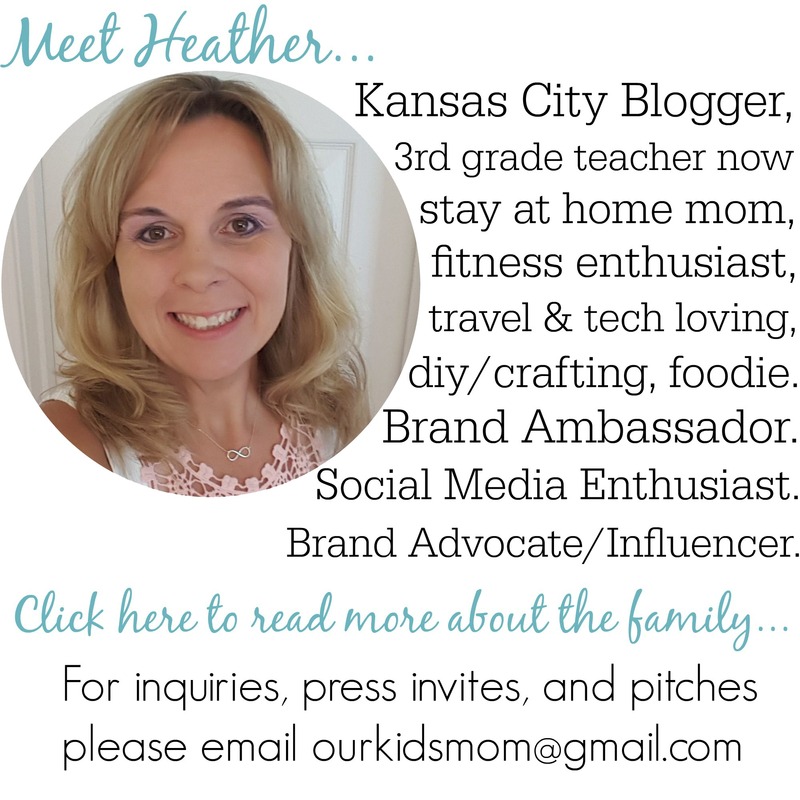 I entered Little Tikes Giant Slide/Bouncer bouncy toy giveaway! The Max. 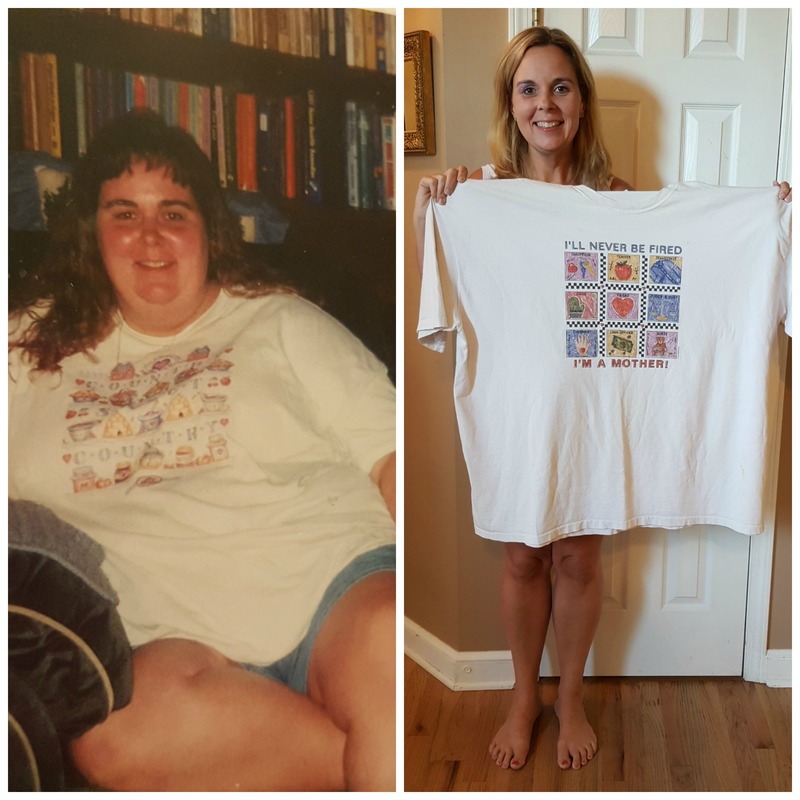 Weight is 55 lbs! This would be so fun! I would also love the Disney Frozen Twinkling Lights Scooter. 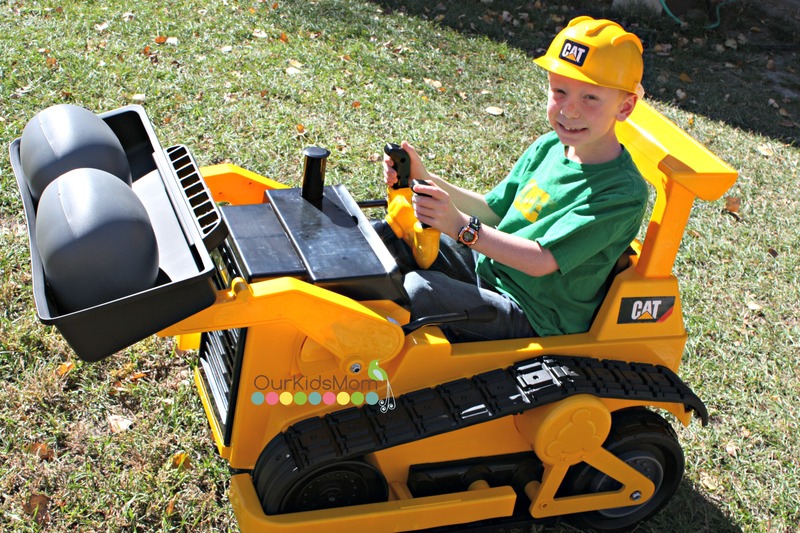 I learned this about this bulldozer; 12V Rechargeable Battery my grandson sure would have a blast with this next summer. I also like the Black Mercedes ML63. I like the VW Beetle ride on 12 volt! So fun!!! 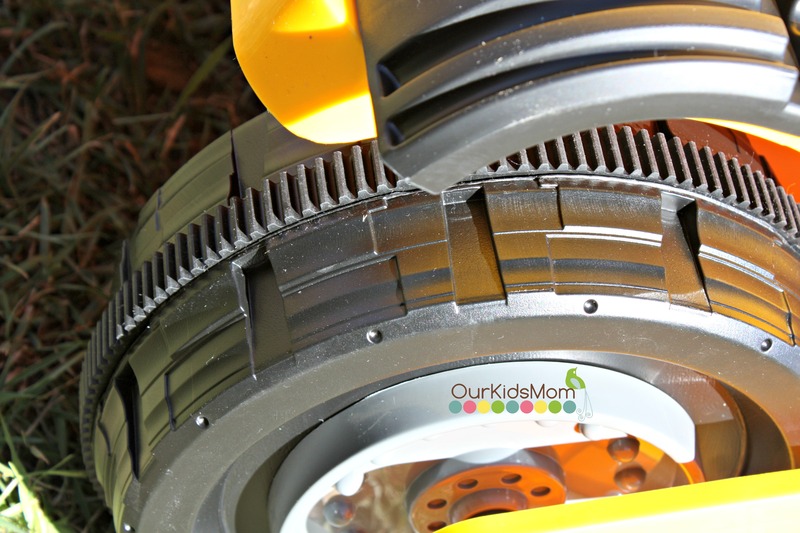 I learned that “All Kid Trax products have a 12 month warranty from the original date of purchase against manufacture defect (excluding the battery)”. I like that it goes in forward and reverse. Thank you for the chance. My two year old daughter would lose her mind over this! She is so into construction and trucks right now. How much fun! On the flip side, she does still have a feminine side and I know she would love the DISNEY DOC MCSTUFFINS TOY RESCUE AMBULANCE. What great toys! I entered the Minions giveaway. I like the Disney Frozen Toddler Quad. My son would love to have the Dodge Charger S.W.A.T. Edition. I learned that they are available at Walmart. I love the 6 V toddler quads selection. i like the KIA Sing-A-Long Soul Car it is adorable. The VW Beetle convertible is nice. Soo adorable! I also love the Disney Doc Mcstuffins Toy Rescue Ambulance. I love that is has a working dump bucket and the weight limit is 55 which means my niece would love it! I like that it has a forward and a reverse. I like that it only goes 2.5 miles per hour. My grandson would like the Planes Dusty Quad. I like the RAM 3500 Dually Longhorn Edition truck. I like the Princess Twinkling Tiara Scooter. I would also like the VW Beetle convertible. So cute! The Black Mercedes ML63 is pretty awesome. I would like to have the MINI COOPER S 12V. I like the Planes Quad ride-on. That looks fun for the kids too. Would love for my grandson Gio. I learned you can purchase it at Walmart. I also like the RAM 3500 Dually Longhorn Edition. I also like the dodge pursuit police car. 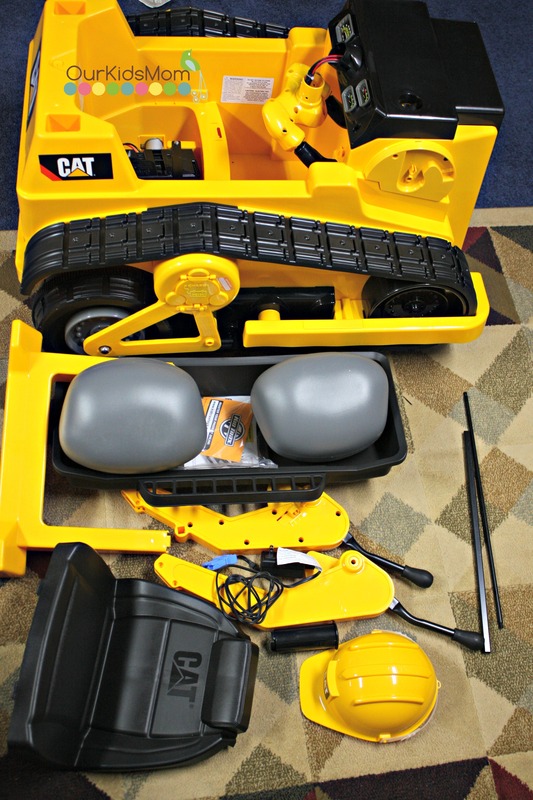 I like that the bulldozer has a 12V Rechargeable Battery. I learned that the max weight you can be to ride on t his is 55 pounds. My daughter would love the Beetle! I love that the weight limit is 55lbs, that means my little one could ride this for a super long time. I like the Unique Cat® Bulldozer Body styling, it is super and I love it… My Grand Son would be to the moon and back over this Bulldozer !!! I learned that the company is located in Olney, Illinois.